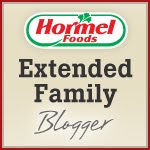 BentoLunch.net - What's for lunch at our house: Hormel May - Let's Talk Holidays! Hormel May - Let's Talk Holidays! It took me a little while to realize that May is filled with awesome food-potential holidays! As Texans, we are quite fond of Cinco de Mayo and all the yummy Mexican foods associated with it. Mother's Day brings the husband and kids cooking breakfast and dinner, and Memorial Day means outside barbecues. Hormel has plenty of great ideas to help you with all of your holiday food needs, no matter the occasion. While Cinco de Mayo is primarily a Mexican holiday, celebrating the Mexican Army's victory over the French in Puebla in 1862, it doesn't mean you can't celebrate too! Everyone looks forward to chips and dips as an appetizer! Serve CHI-CHI'S® white corn tortilla chips, HERDEZ® salsa casera and Wholly Guacamole® dips to please any in the crowd! Beef Fajitas: These savory fajitas are easy to make and perfect for sharing with a large group. Leftover meat and veggies can easily be added to soups and salads. Beef and Bean Burrito Bowls: Burrito bowls are a great way to enjoy the flavors of a traditional Mexican favorite without the wrap. Easily made in less than 30 minutes, these are perfect for lunch and dinner and can be enjoyed with rice or lettuce in a salad. BBQ Chicken Tostada: Combining two favorite flavors – BBQ and Mexican – the BBQ Chicken Tostado features a blend of salsas, beans, grilled chicken and BBQ sauce. Top it off with cheese, sour cream and guacamole – delicious! For Mother's Day, it's always quite nice to honor mom with breakfast cooked by (and cleaned up by) someone who isn't her! All three of these recipes are perfect for little hands to help with. Spanish Ham Frittata: This delicious frittata featured vegetables, Hormel® Cure 81® boneless ham and eggs for a filling meal, and pairs perfectly with sliced fruit. Fiesta Brunch Casserole: For a flavorful breakfast or brunch, try this Fiesta Casserole made with CHI-CHI'S® flour tortillas and other savory favorites! Mushroom, Bacon and Sweet Onion Quiche: Hormel® microwave bacon makes this quiche simple to make and is complete with fresh vegetables. Memorial Day, of course, brings barbecue options. Whether it's the classic hamburgers, hotdogs, chips & pasta salad, to the fancier marinaded steaks and potatoes, no spring is complete without a great BBQ! What are your favorite foods for the May holidays?